* At the time of writing, six teams participate in the Superdivision 2012, fighting for the Ivorian championship. Séwé Sport, who looks incredibly strong, is the current leaders with three matches to go. An updated table can be found here: http://www.fif-ci.com/Tcompetition-classt.php?compTyp=1009. The six teams in the Superdivision have currently played a total of 19 matches during the Ivorian season; 12 matches in the Ligue 1 and seven matches in the Superdivision. The teams that did not qualify for the Superdivision finished their season in the middle of June after having played 12 matches. * AFAD is number two in the Superdivision 2012, three points behind Séwé Sport. In July, AFAD sold their excellent playmaker Bobley Anderson Allegne (born 03.03.1992) to Wydad de Casablanca in Morocco. Personally, I think this is a smart career move for Allegne. Right-back Christian Alex Angbandji (born 12.11.1993) is having a breakthrough season and was recently included in the squad of the Ivory Coast U-20 national football team. Left-back Henri Joël Kouadio Konan (born 20.10.1993) is arguably the biggest prospect at the club and this wonderful talent deserves a chance in a bigger league. Kouadio Konan, who can also play as a left-winger, is also part of the Ivory Coast U-20 national football team. I was a bit surprised to find central defender Abdel Diarra, midfielder Serge Yao N’Guessan and attacker Lassina Koné in the recent squad of the Ivory Coast U-20 national football team; not because these are not talented players but simply because they are fringe players at AFAD who rarely gets playing time. Diarra is an interesting player, formerly of Olympic Sport d’Abobo and the Ivory Coast U-17 national football team. The current stars of AFAD, besides the already mentioned Angbandji and Kouadio Konan, is goalkeeper Clovis Tahourou (born 25.12.1989), central defenders Blaise Adou Dago (born 08.11.1985) and Brahima Bakayoko, midfielders Sanga Topio Coulibaly (born 17.08.1988), Arsène Konan Kouakou (born 10.04.1990) and Souleymane Ouattara (born 11.02.1990), right-winger Kouakou Mansou (born 10.05.1991), playmaker Cheick Moukoro (born 12.06.1991) and star striker Yannick Zakri (born 26.03.1991). Zakri, the skillful speedster who loves to dribble, is top scorer with eight goals; four in the Ligue 1 and four in the Superdivision. The picture is of Zakri and was found on www.afad.ci. * Fans of ASEC Mimosas will be disappointed with their season and I was not surprised to read that coach Sébastien Desabre has been fired a few days ago. ASEC is seven points behind Séwé Sport and will most likely finish third in the Superdivision. The major problem of the team is scoring goals and the current top scorer is striker Samba Diabaté (born 31.01.1986) with only five goals in seven matches. On the positive note, some talented youngsters from the famous “Académie MimoSifcom” have recently forced their way into the matchday squad, including defensive midfielder Jean-Daniel Zirignon Badi (born 13.05.1994) and attackers Mohamed Lamine Diamouténé (born 09.05.1995) and Moussa Koné (born 30.12.1995). All players who emerge from this academy should be watched closely. 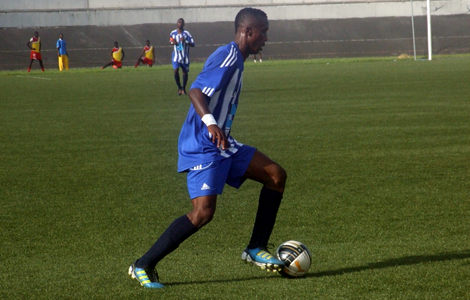 Koffi Yao Constant Kouamé is a central defender signed from Olympic Sport d’Abobo. The youngster has played a couple of matches the heart of the ASEC defence and could be a player to watch. From my point of view, one of the problems of ASEC is that some of their major talents seem to struggle to take the final step needed to become star players; including midfielders Jean Michael Séry (born 19.07.1991) and Hugues Evrad Zagbayou (born 14.05.1990) and striker Jean-Jacques Bougouhi (born 12.06.1992). To be fair; Séry and Zagbayou are key players and wonderful footballers but honestly, I had thought they would be better in their early twenties. Bougouhi, the powerful striker, is still a handful to meet but he has only scored twice so far this season. Akrofi is in top form and has scored three goals in the Superdivision during the last two matches. Other key players in the squad include experienced goalkeeper Hamed Coulibaly (born 14.02.1984), arguably one of the best goalkeepers playing in the Ivory Coast, left-back Bakary Bamba (born 29.10.1992), central defender and captain Laciné Diomandé (born 22.08.1988), midfielder Mohamed Gariba (born 12.10.1990) and the in-form playmaker Guy Serge Brou Kouadio (born 02.06.1991). Brou Kouadio is highly mobile, technically gifted and definitely a player to watch. Jean Christian Pathinvo (born 23.10.1991) is a talent in the making. USCB has also signed a Nigerian player called Timi Henry Sunday who so far is a fringe player.